The Sword-singers were an order of Yokudan warriors who followed the "Way of the Sword", a martial philosophy on blade mastery. Singers were capable of astonishing feats of swordsmanship, and were viewed by some to be as much mages as warriors. They sought strength of body, and of mind. Although the tradition of sword-singing originated in Yokuda, it was brought to the shores of Tamriel by the Ra Gada in the First Era. The sword-singers were instrumental in claiming the entire province of Hammerfell and establishing a new homeland for the Yokudan people. The most accomplished sword-singer in history was Frandar Hunding, whose writings on the subject were revered by the Redguards centuries later. For more information, see the lore article. 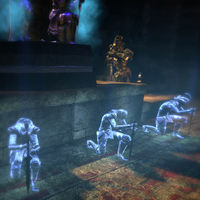 The Sword-singers can be encountered primarily as spirits or skeletons, in areas such as HoonDing's Watch and The Valley of Blades. Sai Sahan sought to revive the art of sword-singing, but was unable to do so. This page was last modified on 11 August 2018, at 20:47.